Bill Doba turned 71 in September, so every annual physical is fraught with anxiety. But this year, his good cholesterol was up and his bad cholesterol was down, and his physician was convinced the old coach was subsisting on a diet of fruit and green vegetables. The lunch meat, not the line of bunk. “Your liver function is fine,” the doctor replied. “Can I give you a big hug?” Doba said. We might have been a little worried about Bill Doba when he pointed his rig toward the Midwest and left our midst. He seemed a bit beat up when his five-year run as football coach at Washington State came to a strangely defined end in 2007. A year earlier, the relentless cruelty of cancer had taken his wife, Judy – not just his long-ago college sweetheart but the truest of soul mates. He had put in 46 years on somebody’s sideline and wouldn’t be the first guy not to have the transition to the non-coaching life take. But he’s just fine – and more than that. Ask him yourself tonight when the Cougars bring him back to Northern Quest Casino to reminisce about the 2003 Holiday Bowl win over Texas and lots of everything else to kick off a week of activities in Spokane leading up to the spring game on Saturday under new coach Mike Leach. In Doba, the Cougars got a solid football man, a caring steward of kids and one of its more underrated storytellers – at a school where it’s been an art form. “John Rushing called last summer,” reported Doba, referencing the rugged safety from his days coordinating the old Palouse Posse. “I hadn’t heard from him in 12-13 years and it’s out of the blue and the first thing I ask is, ‘Are you in trouble?’ But he says, ‘No,’ and tells me he’s married with a couple of kids and that he’s the assistant receivers coach for the Packers. 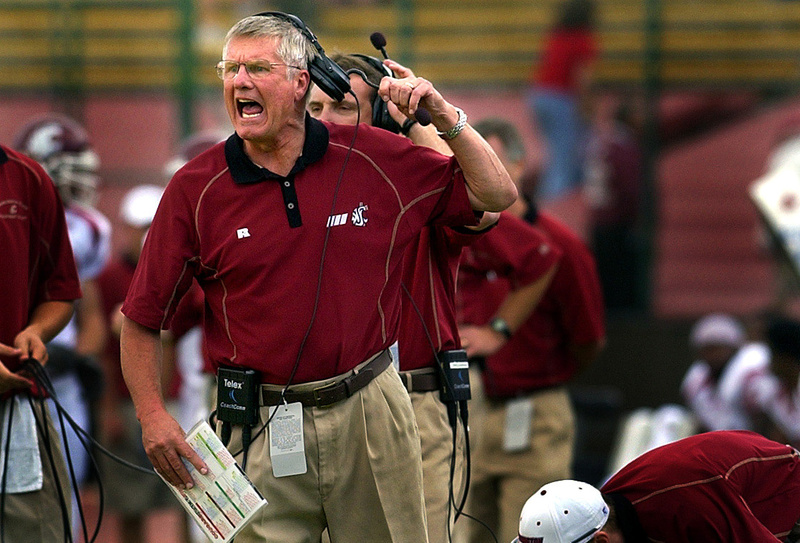 Doba carries a little piece of every player he coached with him still, and so he was more than dismayed when the Cougar program became a punching bag after he left – and hurt when his successor, Paul Wulff, while trying to be forthright, continually insisted he’d inherited a catastrophe. Being Bill Doba, he declines to share his reaction still – but the timing of this invitation is, uh, telling. Life has been full without football. Doba lives on Birch Lake, 300 acres of water in southern Michigan about 35 minutes from his boyhood home outside South Bend, Ind. The lake is stocked with rainbows, and he’s taken fishing excursions to the Yukon and the Amazon. His six grandchildren are all close enough to keep tabs on, including a “tough little gal” who has a full ride to play Division I soccer next year at IPFW. Michigan coach Brady Hoke, a good friend, has had him in for practices, and he’s done clinics at Notre Dame. “The opportunity they gave me to make a few bucks and be able to help my kids and grandkids with things in their lives is something I’ll always be grateful for,” he said. “And where else can you live where you can walk to work to play Southern Cal on Saturday? Hmm. Seems from here that he’s finishing just fine.